The Comptroller-General of Customs, COL. Hameed Ali (RTD) disclosed this on the occasion of the Senior Division Course One participants in Abuja. 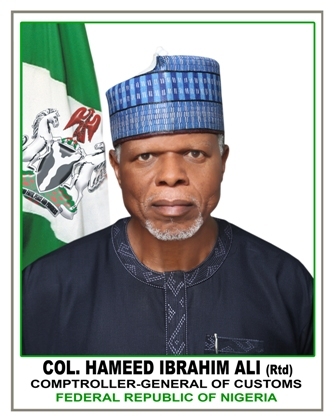 Ali said the revenue figure which was the highest monthly revenue this year, was possible following reforms introduced by the customs management. The CG said the management had to block all leakages in revenue to be able to realize the figure. “Last month, May 2018, was the month we realised our highest collection in terms of monthly revenue. As it stands today, we collected a total of N100.1bn. Ali appealed to the federal government to also consider a new wage package for officers and men of the service. According to him, the Customs Service was the least paid among the revenue generating agencies. He called on the 40 officers who took part in the training programme to redouble their efforts in serving the Service. He also called for legislation that will make Customs Staff College to be self-funding instead of having to wait for budgetary provisions. Among those who attended were the Vice President Yemi Osinbajo; Chief of Army Staff, Tukur Buratai; Chief of Air Staff, Sadiq Abubakar and Minister of Finance, Mrs. Kemi Adeosun.